I thought it time to start my own thread, having jumped in on others already. I have my welcome pack from SSE, still no router, but migration is almost 3 weeks away. I have received a email from +Net today saying that my service is due to cease with them on 21st June, so can only assume that is switch over day. We are on holiday until 26th, so won't be able to see what is happening for the first few days. I may contact SSE and see if I can hold the date back, just in case of any problems. Still hadn't heard anything from SSE about my migration date, but I have had an email from the losing provider saying which date. I took the plunge and telephoned them today to see what was going on. I had to explain that there would be no point in sending an engineer as I already have fibre, won't be here and won't be paying for a failed visit (if indeed they were to turn up~). I was also enquiring when the router would be sent as I didn't want it sitting around the sorting office while away and would want to plug it in once I get home and not wait to be able to fetch it, as I am back at a weekend. I was then told a delivery attempt had been made yesterday and a card left. Erm,no. No card left yesterday, but it has now been left at the local Post Office apparently. Not sure how to get it without the card, but will try tomorrow hopefully. Looking at some of the speed tests on here, it is looking a bit worrying with regards capacity in peak time. I won't have to worry about it now until I get back. Mine was delivered by ParcelForce if that helps - In which case it would go back to the ParcelForce depot (rather than Royal Mail / Post Office) - Although yours may have been sent by regular post. Well, 21st has been and gone and I am still with my old provider!! Not sure what is going on as I am still away until next week, but I do know that my webcam is still streaming from my old Billion router as the SSE router is sat in the conservatory waiting to be connected!! My webcam is still streaming live to me out here, which surely it shouldn't be doing if I had migrated into SSE from Plusnet? I doubt very much my connection would take the same login details, and my no- ip control panel says the dynamic address it is streaming from is allocated to +Net. I have tried to involve SSE through Facebook, but they insist on using some online forms for which I can't answer some questions. They also want me to plug the router in so that they can run some tests, when they know I am out of the country!! Today I have received an email from +Net saying my account will be cancelled on 26th, so I can't do anything about it until the 27th as I will be home late on the 26th. Will start a speed tests thread tomorrow and am waiting for my Samknows box to register the change in connection. 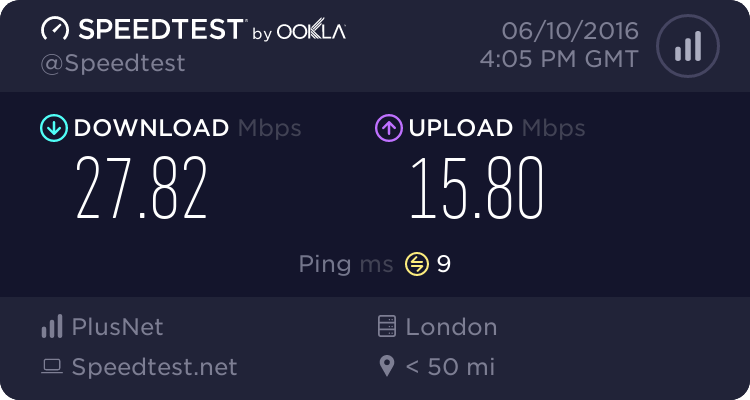 My speeds from 3pm are woeful. 0.1Mbps recored on the speedtest last night, slower than my dial up connection!!! I am struggling to use forums and basic web browsing. 6am in the morning and all is fine. Congestion on the system won't even allow me to run speed tests after 9pm. I will be complaining and stating the service is not fit for purpose. My journey with SSE has been painful. Fantastic service through the day, but come evening the slowdowns are horrendous. Lots of email tennis back and forth to the head of customer service and lost of "you have to use the BT Wholesale checker" to register the slowdown, which BTW doesn't recognise. However, finally got a call from a broadband tech yesterday, explained my results and I was listened to. I explained all the "other" speed tests I had done, all the download sites I had used and how the slowdown only happened between 2pm and midnight. The result is a new router being sent out and a filter. i have to remove the BTO faceplate and put it in the test socket (I didn't realise plug in filters worked with fibre). We'll see how it fgoes from there.